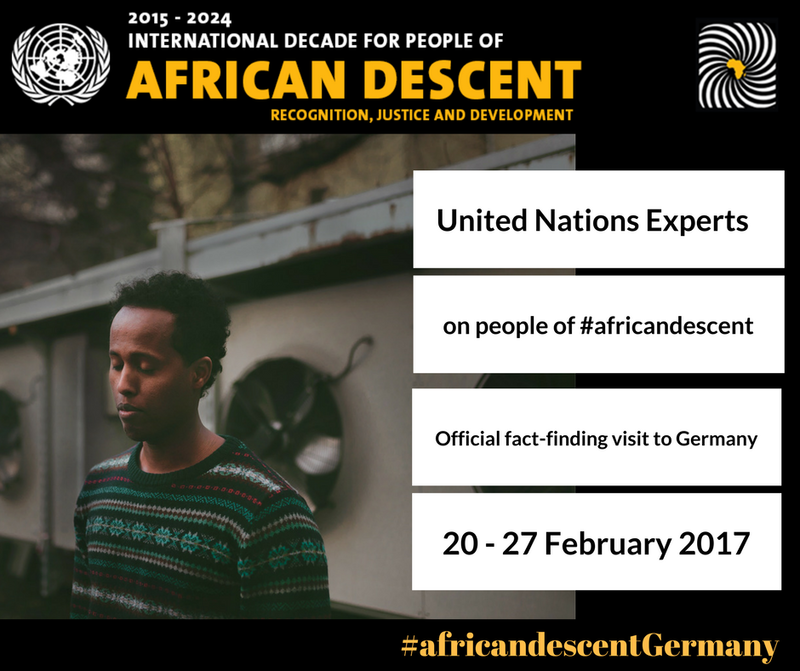 A UN working group of Experts on People of African Descent were in Frankfurt for a fact-finding visit on the 23 February 2017. The visit, a part of the comprehensive programme of events decided upon by a UN resolution A/RES/69/16 sought to meet different civil society groups in Germany, and to hear their reports on the social, political and Economic situation of people of African Descent in the Country. Their findings will be published in a report in September 2017. Dr. Joy Alemazung, senior AGGN Fellow presented a report to the working group on the situation of people of African descent in science and research. In his report, he stated a lack of statistics and funding for research that directly addressed different aspects of the lives of people of African descent in Germany, which translated to policy making targeting this group being made on a very slim fact base. Eric Otieno, an AGGN junior fellow, co-organized and moderated the town-hall meeting. The International Decade for People of African Descent, to be observed from 2015 to 2024, constitutes an auspicious period of history when the United Nations, member states, civil society and all other relevant actors will join together with people of African descent and take effective measures for the implementation of the programme of activities in the spirit of recognition, justice and development.